The Firefly is a two-sail sailing dinghy with no spinnaker, designed by Uffa Fox in 1938. 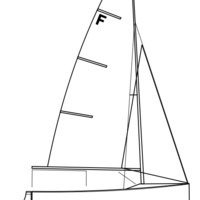 Although originally designed as a double hander, it was selected as the single handed class for the 1948 Olympics but was subsequently replaced by the Finn class. The class then became popular as a double hander, as was originally intended, and remains so today. It has become particularly successful as the de facto team racing boat in the UK, thanks to its high maneuverability, easy handling, and low cost. Another benefit is the use of smaller mains. This is so that the sailing does not cease when the wind blows hard. The Firefly ideal was to produce a one-design dinghy at a low cost; this is why the class celebrated its 60th anniversary in 2006 and continues to grow. The Firefly appeals to all ages and is raced by men and women equally.